We found 10 products available for you products. 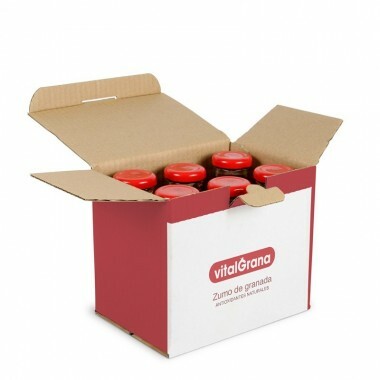 Vitalgrana pomegranate juice has a unique flavour and retains multiple properties and benefits of the pomegranate. Minerals such as sodium, potassium, iron, calcium, zinc and vitamins C, E, A, B1, K1 and beta carotene together with antioxidant polyphenols, from the inside of seeds and the peel, make it a beneficial fruit for us. Pomegranate juice is the best way to acquire all these properties, since all the parts of the fruit, peel and inside of the seeds are included! In addition, juices are the easiest, most practical and simplest way to access the benefits and consume this delicious fruit. Pomegranate juice is considered one of the best detox juices you can consume, and it has been scientifically proven that Vitalgrana pomegranate juice helps high performance athletes to recover easily from competitions and training. Our pomegranate juice uses pomegranates that we grow in the Spanish East as the main ingredient. Thus, ensuring that only the highest quality products are delivered to you, our clients! After selecting the best pomegranates, they undergo an innovative and natural production process that takes advantage of all the parts of the fruit. This allows you to enjoy the best properties of this detox juice in the most convenient way possible. If you want to enjoy all the benefits that pomegranate juice can bring you, check out our website, choose the detox juice or the pack that best suits you and let us start taking care of you. You are one step away from feeling your best!